From one racer on Sunday to another this morning. It's time for a smart device game review, and it's been a little while for one of those. The subject here is Riptide GP: Renegade, which also saw a release on PlayStation 4, Xbox One, and PC. Is this cheaper version a lesser one? Let's find out with this review. Water you waiting for-- this racer is worth it! From the developer of Hydro Thunder, Vector Unit, comes a new aquatic racer with some extreme attitude and the ability to pull off some gnarly stunts. Oh, excuse me-- I'm falling back into the '90s here. Regardless, Riptide GP: Renegade is far from a relic of that era. It's modern, it's well designed, and most importantly, it's fun. Although the game is also on home consoles and PC, this version for smart devices ends up being a winner regardless, and a better deal! Riptide GP: Renegade sports a story complete with a talkative cast of characters-- well, save for your own racer who stays silent. The campaign or career mode plays out in a linear format. You play each racing event in a row, requiring you to at least earn a star (i.e. getting third place in an event) to move on to the next event. The story follows your racer who gets hustled and tricked, thus having him/her end up in jail. Your racer then must slowly go up the ranks, having various characters join your team to teach the person who orchestrated your trip to prison a severe and serious lesson. Sometimes you'll have to contend with the police. Can't have an easy go of it, now can you? 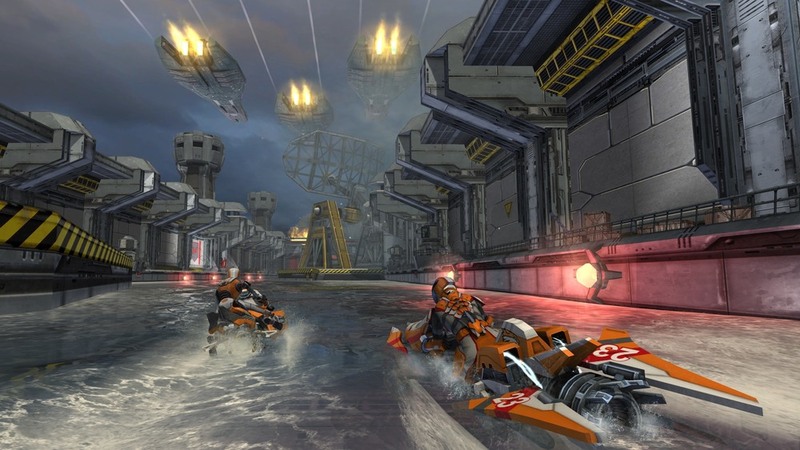 There are nine tracks total in Riptide GP: Renegade, and some feature a traditional circuit-based design with laps while others are races from the top of the track to the very bottom with no return to the beginning. Many races contain ample opportunities for shortcuts to get a leg (or waterbike) up on the competition, and many of these are pretty challenging to find. In addition to shortcuts, the developers have included literal Easter eggs in hidden portions of the races, so exploration of tracks is recommended and very much encouraged. With nine tracks and a myriad of events to go through, you might think that there will be some tedium doing the same tracks over and over again. Said possible tedium is lessened due to there being different event types, but the campaign can still get a little long in the tooth. Regardless, there are regular races as well as slalom races, where the goal is to move through the track, jetting through the track while weaving in and out of slalom markers designating which side to take them. Then, there is a mode where eight racers speed through a track, where every 15 seconds the racer in last place becomes eliminated until there's only one participant left. Additionally, there is a means to unleash your inner trickster, performing tricks off ramps to score points to attempt to get the high score. The campaign also occasionally has championships where you compete in a series of events and the overall point leader is deemed the winner. Finally, boss battles are included, mano e mano races where winning earns you the right to race as that character and their vehicle. The tracks feature plenty of eye candy, but don't get distracted-- there's a race to win. 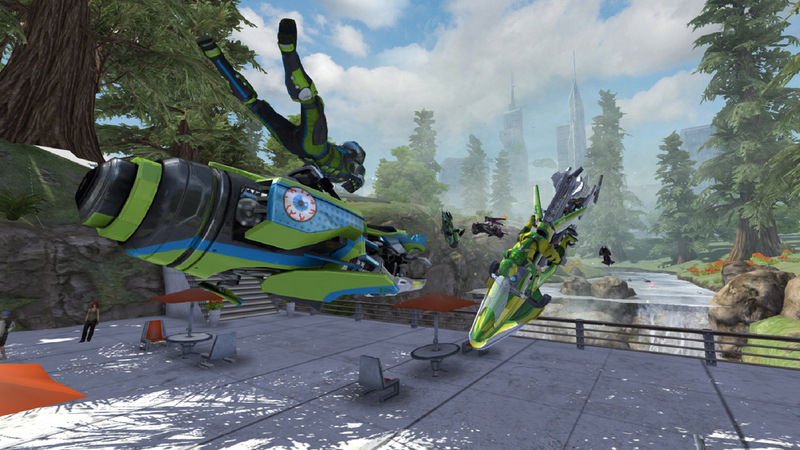 As you play through Riptide GP: Renegade, you earn experience and cash after each event, win or lose. Obviously winning nets you more of both. Experience adds up to gain your racer levels, which give you skill points and a cash bonus. The skill points can be used to buy new tricks and special bonuses such as extra boost energy upon successfully performing tricks and extra speed when drafting someone. Conversely, cash is used to purchase upgrades for your various vehicles in accuracy, top speed, handling, and boost. Riptide GP: Renegade sports a multitude of control options for your smart device, including tilt controls that work well (tilt settings can be optimized for each player), touch controls, as well as MFi controller support. If you have a particular setup you prefer, Riptide GP: Renegade has it, which is fantastic. However, the standard control setup, and the one I used throughout my playtime with the game, was tilt controls with using the touch screen for tricks and to brake. When getting air, you can slide your fingers on the left and right sides of the smart device screen to initiate a trick. Depending on which directions each finger flicks determines the trick you use. Of course, you need to have enough time to pull off the trick, or you'll end up bailing, costing you precious seconds as you furiously tap to reset your vehicle on the track. Score mad air to perform crazy tricks. Just make sure you have enough room to land 'em! Unfortunately, I did find myself struggling to get the game to read my double and triple flick attempts, resulting in bigger trick attempts. This was highly frustrating in the Freestyle events. Regardless, as you perform tricks, you accumulate energy in your boost gauge. You can then tap the boost icon to get a massive burst of speed, great for either making up distance or putting distance between you and your opponent(s). Since this is an aquatic racer, waves undulate, some more unsettled on some tracks than others, and this makes for plenty of stunt opportunities. The risk vs. reward system makes it so yes, successfully completing a trick gives you boost energy, but make the mistake of jumping off a wave or ramp that doesn't give you enough time to finish your stunt, and you'll find yourself submerged in water. ...Since you bailed. But you already knew the conclusion to that hypothetical scenario, right? Weave through the revolving machinery here to stay on course (and on your machine)! Outside of the single player experience, there is asynchronous multiplayer (compete against friends' times on the game's nine tracks) and traditional split-screen and online multiplayer. The latter was difficult to find other people to race, but eventually I did, and it was plenty of fun with minimal lag. 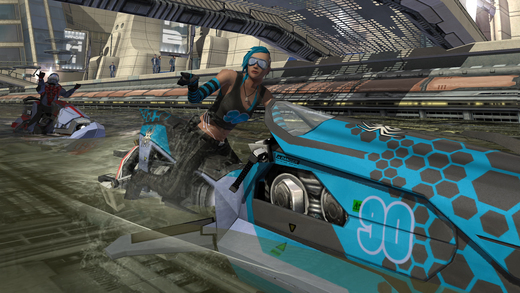 Riptide GP: Renegade looks the part of an aquatic racer. The water glistens and sparkles, undulating to great effect, and many times water will splash and drizzle on the screen before dripping away. The environments sport plenty of detail, and they make for a post-apocalyptic feel in some tracks while sporting a peaceful feel in others. There is a lot of movement going on outside of the boundaries of many tracks, but it's always pretty clear where you need to make a given turn, thanks to numerous guide arrows. Characters and vehicles have a lot of intricate designs to them, making for a game that is consistent in its visuals and a delight to view. 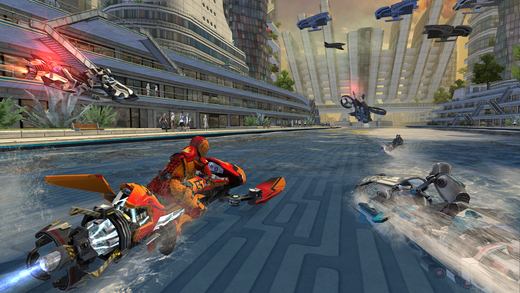 Sound-wise, you won't get a lot from Riptide GP: Renegade, save for vehicle sounds and a rock/electronic soundtrack. It doesn't get grating at the very least. As you can see, everything down to the characters riding these aquatic machines is detailed. Overall, the slightly repetitive nature of playing through the same nine tracks with slight event variations in the main campaign can invoke a sense of tedium, but ultimately it satisfies in both challenge and length. The tracks are well designed, and you can tell serious thought went into shortcuts, difficulty of turns, and environments. Riptide GP: Renegade feels like a much better deal on iOS and Android devices than it does on console, where it costs a mighty $14.99 USD compared to its $2.99 USD price on smart devices. If you're looking for an aquatic racer that is more than capable, Riptide GP: Renegade will get you wet with excitement.